There is something very comforting about a bowl of soup especially on a cold winters day or if you are feeling unwell. Research1around what constitutes a comfort food makes fascinating reading and tends to conclude that individual taste and tradition play a part. Common findings are that soft, smooth, sweet or salty/ unami tastes relate to comfort foods, characteristics often found in soup. Men rank soup more comforting than do women and age is also important with people in the 35-55 age group preferring soup over sweeter comfort foods. Foods that have a close association with childhood, home cooking and warmth are also very comforting so no wonder soup remains a popular food choice. Whether served as a main meal or a snack soups are convenient and filling. 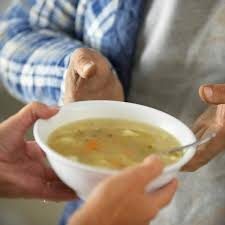 Normally packed with vegetables soup can be pureed for reluctant vegetable eaters or those with chewing or swallowing difficulties.For a protein or fibre boost add beans, lentils or legumes or vary the dish by adding meat, fish or chicken. Changes in market trends over recent years are evident in the soup sector. The traditional dry soup mixes based on barley and split peas along with the canned and convenient dehydrated varieties have now been joined by chilled soup pouches and fresh stock bases. Also in the vegetable section of the supermarket you can often find in winter chopped vegetables with flavour sachets ready to whip into a soup if you are time poor. While these soups tend to be more expensive than homemade soups and lower in dietary fibre this can be remedied by serving them along with whole grain bread or following up the meal with raw fresh fruit. Most processed foods can increase our intake of salt (sodium chloride) as this is often added to enhance the flavour and act as a preservative. Soups that contain cheese, meat and bacon will be higher in sodium so do stop and compare labels if you have high blood pressure or issues related to fluid retention. Soups can be served as a snack with whole grain bread or crackers and if used for a lunch or a main meal the protein value can be boosted if served with e.g. toasted cheese, fish or egg sandwiches. Adding tomato, mushrooms or raw spinach to toasties can also add valuable dietary fibre and iron. For people who are struggling to eat such as the sick or elderly try following up the soup with a milk pudding such as custard or creamy rice or yoghurt and fruit with sorbet. For more soup ideas do visit the healthy recipe section of our website and feel free to share these recipes with friends and family. If you would like more help with control of sodium do contact us for an assessment of your sodium intake. 1.Spence.C Comfort foods-a review. International Journal of Gastronomy and Food Science Vol 9, Oct 2017, p105-109. Teenagers - they rove-eat-sleep and grow!